Shimadzu announces the release of its C2MAP™-2000 automated pretreatment module for cell culture media analysis. This product is for pretreating culture media samples by adding reagents, such as a deproteinizing agent or internal standard substance, filtering precipitated proteins, and diluting samples. 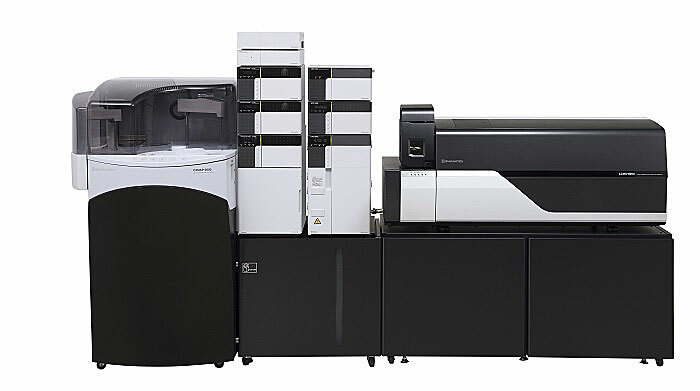 The C2MAP system combines the C2MAP-2000 module with a Shimadzu ultra-fast liquid chromatograph mass spectrometer (LC/MS/MS). By automating all the process steps, from pretreatment to measurement, the C2MAP system shortens the culture media analysis time for up to 95 components in culture supernatants* to one sixth the previous level. In addition, this system can be operated by inexperienced operators. After simply loading culture supernatant samples, reagents, and pairs of filter and recovery vials, the C2MAP-2000 module is able to execute all steps from pretreatment to LC/MS/MS measurement without any human intervention. This seamless execution of everything from pretreatment to measurement not only makes it easy to process samples unattended overnight or on non-working days, it also enables samples to be controlled using the same ID for all process steps. This minimizes the risk of selecting the wrong sample and ensures traceability. C2MAP-TRENDS time-course viewer software loads the obtained measurement data and graphs temporal changes in each component concentration as trend graphs. In recent years, in antibody pharmaceutical fields, it has become increasingly important to record the consumption of components and accumulation of waste matter (secreted metabolites) in culture media, so that cell cultivation parameters can be optimized for manufacturing drug substances. In addition, in regenerative medicine fields that involve iPS, ES, or other cells, there is a need for technology that can evaluate cell quality in real time without damaging the cells. There is also a need to reduce the replacement frequency of expensive culture media. Since monitoring the changes in culture supernatant components over time provides information that is useful in these fields, LC/MS/MS analysis has become increasingly important in the optimization of cell culture conditions. However, due to the lack of products available for seamlessly performing processes from sample preparation to measurement, there was a need for a system that could be easily used even by inexperienced operators. Therefore, Shimadzu developed the C2MAP-2000 automated pretreatment module and the C2MAP system for steps involved in determining the status of cultures and researching cultivation process steps at major pharmaceutical companies, biotech ventures, pharmaceutical CMOs (contract manufacturing organizations), and various research institutions. In the future, Shimadzu intends to offer solutions based on LC/MS/MS measurement technology for controlling and optimizing cell cultivation process steps. C2MAP-2000 automated pretreatment module: Performs pretreatment processes necessary for LC/MS/MS analysis. Nexera X2 ultra high performance liquid chromatograph: Separates individual components contained in pretreated samples. LCMS-8060/8050 ultra fast liquid chromatograph mass spectrometer: Detects each separated component with high sensitivity and measures their mass. C2MAP TRENDS special viewer software: Plots a line graph of changes in respective component concentrations over time, based on LCMS-8060/8050 results. These graphs are useful for understanding how the concentration of respective components in a culture supernatant increases or decreases during the cultivation process and for understanding the differences in how respective components fluctuate given different cultivation parameters. C2MAP, C2MAP system, Nexera, and LCMS are registered trademarks or trademarks of Shimadzu Corporation.